We’ve talked lots on the blog about how we communicate and the tools we use to get work done as a remote team, but I thought it might be fun to give you a bit of a different view into the life of a Buffer team member. In this post, I’d like to tell you about the ways we communicate that aren’t so much about work. From GIFs in Hipchat to theme days on Sqwiggle to supportive notes on iDoneThis and even our UP apps, Buffer has a great variety of “virtual watercoolers” that keep us connected in work and play. Here’s an inside look! And do a lot of general hanging out, whether it’s posting a new favorite band to the “Music Sharing” room (recently mentioned: Flight Facilities, Run the Jewels and Steely Dan) or sharing some of the awesome stuff we hear from our great customers. It’s also a great place to celebrate occasions, like business milestones, anniversaries and birthdays. Whatever we’re talking about, photos and GIFs are always appropriate. And emojis are a close second…. Sqwiggle is our go-to tool for conversations that require some face-to-face time, and it’s also how we sync up for our daily pair calls and weekly mastermind chats (more on those in just a bit). It’s also the spot where all our free Kindle books get listed, thanks a little Wufoo-Zapier action. This way, other team members can get inspired by a new title, or compare notes on a book you have in common. One of Buffer’s great perks is a Jawbone UP that helps us track our nightly sleep and daily steps. We love to cheer one another on for a great performance on either, so the Jawbone app becomes another spot where we can gather, chat and support each other. Each new week at Buffer, we take time to reflect on our self-improvement goals for the week and write them down in a group hackpad. These are the improvements we’ll work on throughout the week (and often, even longer) and discuss on our pair calls. Since hackpad has a neat comments feature, this shared document often becomes a spot for us to share common challenges, recommend apps and tools or just cheer each other on as we work on achieving our goals. Here’s a look at a recent entry from Nicole that got lots of love. Buffer’s pair calls are one of my favorite things! With a growing team spread across the globe, it’s so much fun to find out Monday who your pair partner is for the week and spend some time each day catching up with them as you talk about work projects and self-improvements. Once a week, each team member at Buffer pairs up with another for what we call our “weekly masterminds.” Our idea of a mastermind has evolved from the team lead-team member pairing we started with to the teammate-to-teammate version we now practice since we began experimenting with the decision maker way of working. These are deep dives into high-level challenges and accomplishments, shared with the same partner each week for the highest level of trust and vulnerability possible. We’re paired based on similarities in our work, but the conversations are often just as much about our personal lives and improvements as they are about what we’re doing at work. So there’s a quick look at some of the ways we work and play together as a fully remote team. It’s very different than any other workplace I’ve ever had, and I have to say I wouldn’t trade it for the world! What are some of the gathering spots for community and fun where you work? I’d love to hear about them or even see them in the comments! I think you buffer heroes are awesome! I wish I could hang out more with you. I hang out via many social media plus local hangs outs too. Like our local chamber of commerce, Meet UPS and non profit groups. Hope you find time to hang out with me too at the water cooler!! Hey there! Wow, it seems like you are doing lots of great networking. Way to go! Ya’ll look like you have a lot of fun!! By the way, theme days are my jam! There’s never a dull moment! :) Got any theme day ideas for us, Monica? My favorites are twin day (coordinate with a co-worker), tourist day, unusual super heros, and dress as you favorite literary character. Oooh, those sound like a ton of fun! Love the literary character idea! Thanks! Well, you guys are officially the cool kids of the inter web! Do you only wear pink on Wednesdays? All of these examples (plus this other article you wrote http://open.bufferapp.com/buffer-distributed-team-how-we-work/ ) are AWESOME. I work remotely with Venly (Venly.com- teaching small businesses how to use social media for SEO & customer engagement) so I too communicate with the mothership daily. BUT… I just shared this article with my co-workers because you guys are #Winning the connection game! I want to bring some of these ideas to our online workspace… Imitation is the sincerest form of flattery? So thank-you Buffer, I hope you’re happy, because we’re all officially jelly. Keep it up! Hi Emily! Thanks for all the love and kind words! It sounds like you have an awesome workplace, too. Feel free to borrow liberally any of our ideas that you like, or riff on them to create something totally new. I’d love to hear what you come up with! P.S. Killer Mean Girls reference! Carolyn’s use of “Buffery” had me *literally* LOL’ing – like, full-out guffawing (it’s a real word, I promise)! Please keep these fun, transparent posts coming. I’m hoping more companies follow suit! I’m really glad you liked this one, Thea! It feels great to keep digging and thinking on what avenues we could show y’all that we haven’t before. Haha, yep we all were tickled by the transparent tape joke. :) Pun humor is a Buffer favorite. That would be great! Thanks a lot for your daily inspiration and continuous improvement and transparency. Love you guys! Fun article. Loads of tips and tools here I’m gonna put to use. Thanks Courtney! Cool, so glad to hear that! Thanks for checking it out! Love this! what other companies are successfully managing and growing remote teams at fast growing startups? My name is Rebecca McLaughlin and I am a student at the University of Canterbury, New Zealand. 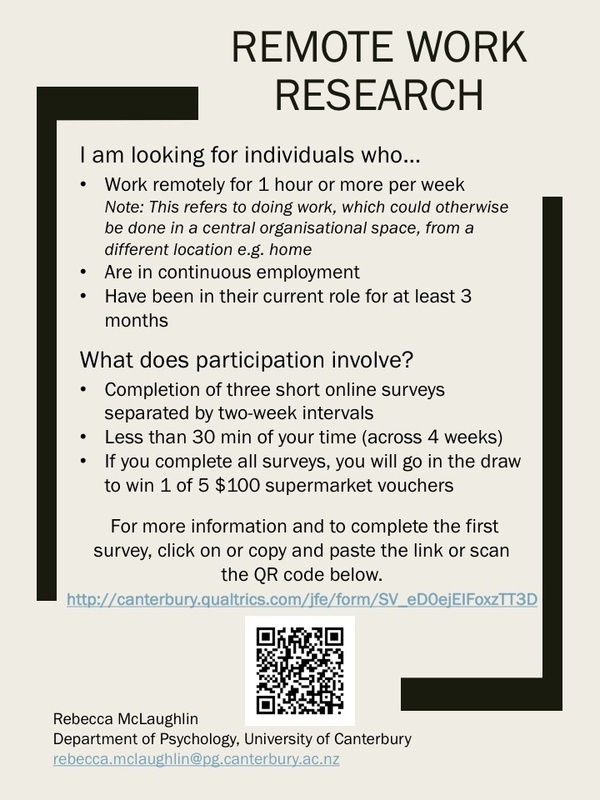 As part of my Masters in Applied Psychology Dissertation I am conducting research on remote workers. Specifically, I am investigating for whom remote work is best suited, how organisations can ensure success in implementation, and the potential outcomes of these arrangements. The resulting knowledge will contribute by allowing the benefits of remote work to be more widely enjoyed and further advancements to be made in the contemporary working environment. If you work remotely, I would greatly appreciate your participation – you even have the chance to win a prize! Additionally, if you know of others who remote work please share this information with them. The more people who participate, the more accurate and valuable the results. Your help with the distribution of this survey is much appreciated! Amazing. You guys are owesome and your working practice is one of the key factors of your tremendous success. I wish I could have same culture in my career as well. I work on a remote team that spans all of North America and I’d love to chat with someone further about what types of community building things Buffer does? Are there any remote off-sites? How do you separate work time from “hangout” time or is it very integrated? Would love to chat! Such a great post, Courtney, and still quite relevant 4 years later! One option I’d like to add, for the possibility of delighting a remote employee with a surprise on their birthday, work anniversary (“Buffer-versary” in your case), new baby, or other special occasion is VidHug. It makes it super easy to coordinate a surprise video starring the team, you simply invite them to join, they easily record a happy message at a time that suits them (asynchronous is gold in remote! ), and VidHug does the rest to create a beautiful surprise!